Bank Negara Malaysia’s international reserves down 1.1 per cent to US$101.7 billion (RM423.8 billion) as at October 31 this year, from US$102.8 billion on October 15. An academic today urged the government to be clear of the objectives when imposing behavioural taxes, citing the soda tax as an example. The Sarawak government’s move to impose a 5% sales tax on petroleum products produced in the state will not only affect Petronas but also the market, said Economic Affairs Minister Mohamed Azmin Ali. RHB Bank Bhd today introduced the RHB Dual Credit Cards, which are targeted to increase new customers card acquisition by 30% by the first quarter of 2019, from 500,000 credit cards currently. The institutional reform instilled in the 2019 Budget will improve the country’s fiscal progress, backed by more accountability, integrity and openness. A Malaysian court on Wednesday set Jan. 7 for two Southeast Asian women charged with murdering the North Korean leader’s half brother to begin their defence, as their lawyers complained that some witnesses were unreachable. 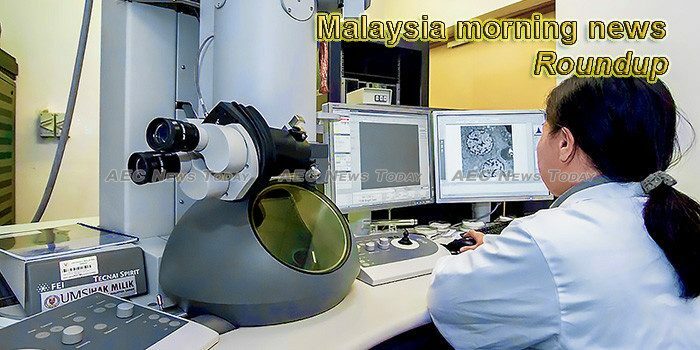 Forty-six Malaysian companies have been named the Best Companies to Work for in Asia by human-resource publication, HR Asia. A chief economic researcher has warned of a possibly wider fiscal deficit should the global Brent crude oil price dips below US$70 a barrel. The government’s proposal to set up the world’s first airport real estate investment trust (REIT) is expected to be finalised between the second-quarter (Q2) and third-quarter (Q3) 2019. The Malaysian Association of Tour and Travel Agents (MATTA) and Cruise Lines International Association (CLIA) have developed a collaboration through a Memorandum of Understanding (MoU) for strategic cooperation to drive the emerging cruise tourism in Malaysia. Realme smartphones are officially available in Malaysia with a launch in Kuala Lumpur today (Nov 7) unveiling three new models. These devices are targeted towards young consumers looking for affordable devices with flagship-like features. Malaysia will seek Japan’s assistance on investment in the artificial intelligence (AI) industry in the quest to take its technologies to a more advanced level, Tun Dr Mahathir Mohamad said. Finance Minister Lim Guan Eng told Goldman Sachs today to return the US$588 million (RM2.4 billion) fees it was paid for its work with 1Malaysia Development Bhd (1MDB). The Malaysian government’s efforts to get the JR Kyushu Railway Company’s cooperation to look into the problems of the national railway is to ensure that services are fully beneficial to the nation and the people, according to Prime Minister Tun Dr Mahathir Mohamad. Sapura Energy Bhd will hold an extraordinary general meeting (EGM) here on Nov 29 to seek shareholders’ approval for its proposed rights issue to raise RM4 billion. Genting Malaysia Bhd shares rose as much as 16 sen or 4.43% to RM3.77 so far today on bargain hunting after the stock fell on Monday following news Malaysia’s casino tax will be increased to 35% of gross income. Malaysia’s central bank is expected to keep its benchmark interest rate unchanged on Thursday, a Reuters poll showed, with the economy facing a widening fiscal deficit and slower growth. Late fund buying powered blue chips higher on Monday as consumer stocks rallied while Digi and Axiata helped to give the FBM KLCI a significant boost. Malaysian Technology Development Corp (MTDC) Sdn Bhd has urged more small medium enterprises (SMEs) to embrace relevant know how of the fourth industrial revolution with the launch of the Centre of 9 Pillars (Co9P) initiative. RHB Banking Group expects to increase the number of its cardholders by 30 per cent by the first quarter next year, driven by its latest product, the Dual Credit Card. Construction and property player Gadang Holdings Bhd, which currently tendering for up to RM2 billion worth of projects, aims to secure a slice of infrastructure projects expected to be rolled out in East Malaysia following the states’ higher allocation on development expenditure next year. Coway Co Ltd, a South Korean maker of home appliances, is mulling over establishing manufacturing operations in Malaysia with the aim of using the country as a launchpad into other South-East Asian markets. Fitch Solutions has maintained its 2018 and 2019 budget deficit forecasts for Malaysia at 3.7 per cent of gross domestic product (GDP). Iskandar Malaysia recorded investments totalling RM19.8 billion in the first nine months of this year, raising the cumulative investments committed since 2006 to RM272.90 billion. Tourism Malaysia had initially aimed to hit 33 million overseas guests in two year’s time but speaking to [email protected] chairman Datuk Ahmad Shah Hussein Tambakau revealed it had decided to revise the figure to 30. Malaysians have been advised to stop making outrageous assumptions over the government’s intention to ratify the International Convention on Elimination of All Forms of Racial Discrimination (ICERD) which could lead to negative perceptions of racial ties in the country. Hunza Properties Bhd, Ideal Property and the Real Estate and Housing Developers Association (Rehda) donated RM455,172.50 to Tabung Harapan Malaysia (THM) today.